Wikipedia deflation is, Business process mapping refers to activities involved in defining exactly what a business entity does, who is responsible, to what standard a process should be completed and how the success of a business process can be determined. While this is acceptable approach, we take a slightly lighter and more modular approach to the activity of process mapping and how it relates to small business. What this means is that a process map can be highly effective for maximizing efficiencies for one business process and does not have to take a full day or an entire team to accomplish. While process mapping is common in traditional manufacturing and industrial environments, we find that process mapping can be highly effective for businesses of all sizes particular in the areas of defining commerce and transactions between customers and suppliers. 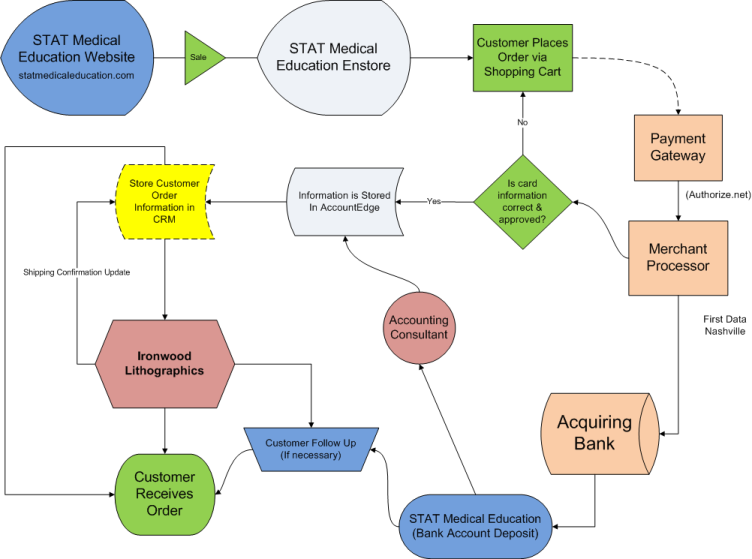 View the example below which outlines the eCommerce information/money flow for STAT Medical Education LLC. We find that low level flowcharts are the most common and easy to implement, however it is also important to note other types of more advanced process maps that can be used to breakdown and analyze various parts of a business. 1.) High Level Process Map – This is the more along the lines of the wikipeida version and attempts to encapsulate an entire business or organization. 2.) Cross Functional (Swim Lanes) Map – Used to look at low level flowcharts in pieces that correlate different departments, regions, etc. 4.) Value Stream Map – Also commonly referred to as activity map, the value stream map is a tool designed to identify target product/service and evaluate current state to ultimately improves process, eliminate waste, etc. 5.) Value Network Map – Similar to value stream but setup in a more “real-world” or inter-organizational approach. Designed to identify stakeholders, information and product/service flow. Many of these tools are among the elite of Six Sigma and Lean Experts and are very challenging to design and implement. While each model has its specific use, it is critical to not get stuck in analysis paralysis and simply choose a tool that best fits the business situation (as currently viewed) and modify if need be later on as perceptions and paradigms shift during the mapping exercise. Why Should I Create Process Map? For one, ISO 9001 requires a business entity to follow a process approach when managing its business, and to this end creating business process maps. However only 25,000 businesses in the US are ISO 9001 and thus the majority of businesses will find other more specific benefits for utilizing this methodology. Performing a process map can be a very difficult and daunting task the first time around, especially for those with no Supply Chain or Industrial Engineering experience. For those clients who seek out one of Total Merchant Network’s services, a full process map detailing the procedure is part of normal protocol and is offered at no additional cost. For those customers looking for help with a more advanced process map or one detailing another function of the business, Total Merchant Network will perform these on a case by case base. Cost is dependent upon scope, complexity and time allocated to complete project. Please contact us for more information.